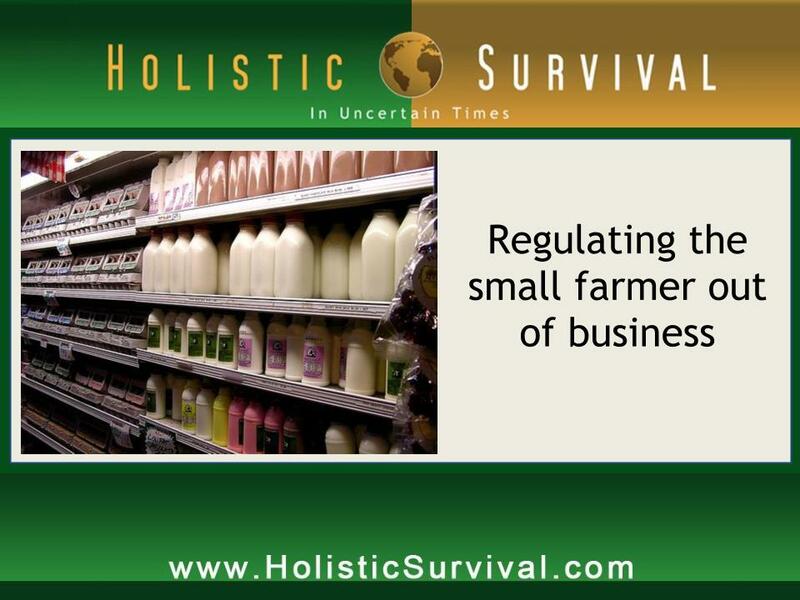 On this episode of Holistic Survival, Jason Hartman talks with Karine Bouis-Towe, founder of Grassfed on the Hill Buying Club, about the benefits of raw milk over commercially pasteurized milk and how the government, including the FDA, has launched aggressive and forceful raids against America’s small farms, farmers, co-ops, and private buying clubs to stop the distribution of raw dairy products. Learn more at: http://HolisticSurvival.com/category/audio-podcast/. Karine discusses the work of the Farm Food Coalition, a nationwide consumer coalition that was formed in response to growing serious government interference and bureaucratic regulations against independent farmers and producers. Aiding in the invasion of the rights of these farms to produce and distribute raw milk and other dairy products are the corporate food producers. She cites two examples of FDA investigations that highlight the government’s interference in citizens’ rights to choose the foods they consume. Karine Bouis-Towe is the founder of Grassfed On The Hill buying club, coordinating farm fresh food in the DC Metro Area since 2004 for over 1600 households and a co-founder of the Farm Food Freedom Coalition. She is passionate about food security, preserving and increasing local farms and is dedicated to securing access to farm fresh food for generations to come. Raising children has made a huge impact on where she puts her time and energy. Through this experience, she realized the urgency in taking back our rights as Americans to have access to the foods of our choice to promote health and wellness. She is passionate about helping others who seek whole, unadulterated food and is dedicated to creating these options and advocating for them. Prior to raising children, Karine worked in the Information Technology Field and this fall will turn her attention to her true calling, biodynamic farming. Jason Hartman: This show is sponsored in part by Audible.com. Narrator: Welcome to the Holistic Survival Show with Jason Hartman. The economic storm brewing around the world is set to spill into all aspects of our lives. Are you prepared? Where are you going to turn for the critical life skills necessary to survive and prosper? The Holistic Survival Show is your family’s insurance for a better life. Jason will teach you to think independently, to understand threats and how to create the ultimate action plan. Sudden change or worst case scenario, you’ll be ready. Welcome to Holistic Survival, your key resource for protecting the people, places and profits in uncertain times. Ladies and gentlemen, your host Jason Hartman. Jason Hartman: Welcome to the Holistic Survival Show. This is your host, Jason Hartman, where we talk about protecting the people, places, and profits you care about in these uncertain times. We have a great interview for you today and we will be back with that in less than 60 seconds on the Holistic Survival Show. And, by the way, be sure to visit our website at HolisticSurvival.com. You can subscribe to our blog which is totally free, has loads of great information and there’s just a lot of good content for you on the site. So make sure you take advantage of that at HolisticSurvival.com. We’ll be right back. Narrator: Now, you can get Jason’s Creating Wealth in Today’s Economy Home Study Course, all the knowledge and education revealed in a 9 hour day of the Creating Wealth Bootcamp, created in a home study course for you to dive into at your convenience. For more details, go to JasonHartman.com. Jason Hartman: It’s my pleasure to welcome Karine Bouis-Towe to the show. She is with the Farm Food Freedom Coalition and the Grassfed On The Hill Buying Club and we are going to talk about the recent government intervention, and I think intervention is the kindest way to put it – maybe we’ll call them raids which is what they really were – on people who are selling raw foods and kind of dig into what this is all about. You’ve probably heard about it in the news media recently. And it is possibly another act of government oppression if you will. And let’s hear more about it. Karine, welcome. How are you? Karine Bouis-Towe: Thank you, Jason, for having me. Jason Hartman: Pleasure. So you’re talking to us from the Washington D.C. area today? Jason Hartman: Fantastic. Well, tell us about your organization and what you’re trying to do. Karine Bouis-Towe: Farm Food Freedom Coalition was formed after two raids occurred, one on the east coast and one on the west coast. And consumers from both of those two buying clubs came together in order to form the coalition to put a grass roots effort in place by consumers to tell the government that we don’t want them to interfere with our food choices and our right to be healthy. Jason Hartman: Well, I have to say good luck with that because the government is very much involved in that part of our lives between the FDA and the agriculture issues and so forth. But, first of all, tell us just before we go on, what is a buying club? A buying club is a group of consumers that come together. In our case, we are working with the Amish community who do not use the internet. So myself and Liz Reitzig are coordinators for the Grassfed on the Hill Buying Club here in the DC metro area, serving in the last 6 years over 2000 families. And what we do is just help the consumer put their orders into their farm. And we communicate with them and different details about what’s going on at the farm, what products are available. So buying clubs are just a group of consumers that come together to purchase food directly from a farmer. Jason Hartman: Okay, and so the farmers are the Amish in this case. What are the Amish doing different than commercial corporatized farms. Karine Bouis-Towe: The Amish, it’s part of our culture, part of our way of life to not use different kinds of electricity, for example, they don’t use it. They do things the natural way, the way that our forefathers did things, without the interventions or all the progress that’s occurred in industry, in our food in particular. We don’t really care for a lot of the progress that’s occurred when it comes to processed food because we find that it’s detrimental to our health. And many of our consumers have come this route because of health problems. And so it serves a really important part of our society that’s sick right now. And a lot of that is based on food choices, environment that they’ve been living in. Jason Hartman: A lot of people have seen the movie Food, Inc. or King Corn, and these documentaries are becoming somewhat popular which I think is a great sign that the consumer is becoming more aware. Of course, most people aren’t but at least there’s an inkling of interest out there. I want to circle back to the governmental issues and the regulatory issues and talk about the FDA and so forth, Karine, but you mentioned health and why both you, your group, the Amish, etcetera, don’t like the “progress” that has occurred with the food industry. Talk about some of the health issues that people might want to be aware of. Karine Bouis-Towe: Well, the centralized factory farm food system that we currently supply the grocery stores is convenient and we don’t want to take that opportunity away from other people, but we want the industry to share the market. And what we find is the issues with those foods is that they’ve been over processed, the animals are not in sanitary conditions, they’re not in humane conditions. The milk, in this example, while milk is one of the issues that we’re facing with our buying club and the FDA, milk when it’s processed, it kills all the enzymes, the lactates is gone which helps people who are lactose intolerant digest dairy. And the vitamins with the probiotics are taken out of it. So basically it’s a dead product and it’s actually not good for you, whereas raw milk actually is health promoting. So the environment that the animals are in, the food that are being fed, all the GMO that they’re being fed, so much about our industrialized, centralized convenient food system affects the food that we’re consuming to the detriment to our health. And what’s happened in our government in the regulatory system is there’s this revolving door between industry and government, so you have corporate executives who are crossing the line into our government agencies to further their cause, further their industry’s progress by creating regulations that help them. So, for example, you could take Mike Taylor at the FDA – he’s a prime example – he works at Monsanto and he’s crossed the line back and forth several times. And what happens each time is that something gets passed that the consumers don’t want but still happens because our government has been overtaken by corporate interests. And this is something that the Farm Food Freedom Coalition, one of the parts of what we’re doing is trying to shed light on what’s happening and how dangerous that is for the average consumer because they don’t know what’s happening to their food and how the government has been infiltrated by corporations, so the government’s no longer protecting the people. Jason Hartman: And it’s interesting – the era under which we are living nowadays, it’s really a form of fascism. Most people don’t realize that, but the big corporations, the corporatocracy is just in bed with the government. And I think the Secretary of Agriculture that Obama appointed is also a bigwig from Monsanto if I’m not mistaken. And Monsanto, from what I know about it, seems like a very evil company frankly because they’ve patented nature in terms of seeds and they’ve bullied farmers around and it’s just pretty scary what’s happening. Karine Bouis-Towe: Let me take a brief pause. We’ll be back in just a minute. Jason Hartman: If you love audio books as much as I do and you love making your automobile or the gym or whatever, but especially your automobile a rolling university then you’ll love Audible.com. I’m a user of it. I buy books every single month from Audible and they’re available through my membership so it’s a great thing. You can get a free trial by going to AudiblePodcast.com/HolisticSurvival. Make learning a lifelong endeavor. Jason Hartman: You’ve also mentioned GMO and I’m not sure the audience knew what that acronym is. That’s Genetically Modified Organisms. And we actually did a show on that, on genetically modified foods and the issues there. So, Karine, you mentioned something that was kind of interesting. You say that in milk, pasteurization makes it basically a dead product and you lose some of the beneficial probiotics that are in yogurt for example. Well, I’m kind of curious. Why is the government okay with those being in yogurt? Yogurt is living. You have live cultures in there which are good for you. Why not in milk though? Why is the government making it an issue with milk and not yogurt? Karine Bouis-Towe: Well, there’s two different kinds of milk. Let’s go there first. First there’s milk that’s from the factory situation with the animals that don’t live on pasture and are milked heavily. Jason Hartman: Pumped with hormones. Karine Bouis-Towe: Right, hormones, antibiotics, they’re living in unhealthy conditions. The milk that comes from those cows is meant for pasteurization. The milk that we promote comes from independent farms where the animals are mostly on pasture, mostly grass fed, never needed antibiotics or hormones because you’re living the way they were intended to live, the way our forefathers were raising animals and drinking milk and being healthy. It was health promoting. And so when animals are in this health promoting environment, they produce milk that has good things for you like probiotics and it doesn’t contain the dangerous bacteria like e-coli, the airborne effects of it, it doesn’t contain the things like that that are dangerous to the general population. So that’s why the government has to pasteurize that factory farmed milk because it could potentially be dangerous whereas the milk we drink we rarely ever find out that there’s anything wrong with it, especially our own experience – we’ve been drinking it for 6 years with over 2000 households. We’ve never had anybody ill or sick from it. Jason Hartman: And so far as I know, I don’t hear about Amish people dying left or right either, right? Or getting sick. Jason Hartman: Yeah, interesting. But I guess the government just doesn’t want to know that. They somehow want to be they’ll say ignorant of that, they’ll say it’s unsafe. But the real reason is it’s just all about money, right? Because the food companies, maybe ADM, etcetera, they’ve purchased the government just the way Wall Street has purchased the government too in the financial world, right? Karine Bouis-Towe: Right. You could talk about government corporate subsidies. I mean 3/4 of all the farm subsidies go to the largest most wealthy farms, not independent farmers. So they have a vested interest in the market and they don’t want to share the market with the independent farmer. Jason Hartman: So what we’ve got here is the best government money can buy it sounds like, right? Karine Bouis-Towe: Unfortunately that is America. That’s why we want to rise up against it. Jason Hartman: So tell us about your case with the FDA. I mean you’re pursuing a case against the FDA? Karine Bouis-Towe: That’s correct. That’s what FarmFoodFreedom.org – you can make a donation there if you want to get behind what we’re doing – we are prepared to hire Jonathan Emord who’s won 8 cases against the FDA. Jason Hartman: I had him on the show. He was a great guest. Jonathan Emord was really, really an interesting guest, so fantastic. Karine Bouis-Towe: He’s very supportive of the cause. He works with us now. We haven’t paid him anything yet. We’re raising funds, which it’s gonna be expensive – it’s gonna be a 1 to 3 years long case, and we hope with that case to persuade the government and to get the word out there to consumers that there is a safe raw milk product that should be available and that the FDA and other government entities should not be getting involved in the relationship between farmers and consumers. And if that’s what we want to have to consume, then we have the right to have it. Jason Hartman: So when the government initially struck against these independent farmers, or I should say buying clubs really, what did they do? Did they just go in and arrest them? I mean what happened? Karine Bouis-Towe: It’s unbelievable. They went into our farmer, Dan Allgyer, this has been in the press. They went in fully armed, guns pointed at our Amish farmer with his suspenders and his hat and good family man with lots of children watching what was going on from the house. They were pointing a gun at him and they were saying we are giving you these papers. We want you to cease and desist operation. That’s where all of it took place was at the farm. And they went through his property until he finally got them to leave. The sheriff was with them, so they had the right to be there. Jason Hartman: So they basically had a search warrant and a cease and desist order I guess. Why did they feel it was necessary to pull out their guns? That’s unbelievable form of intimidation. I mean if you’re in a lawsuit for example, a marshal comes in and he’ll have a gun but he’s not pointing it. He’ll serve you with some papers. But why would they do that? Karine Bouis-Towe: We’re in a police state. They just felt like that was an intimidation factor and they were gonna intimidate this Amish man and whatever questions they asked him to get him to talk which he would not do. He had very strong resolve. He believed in what he was doing and it didn’t work. And that’s what they were doing – they were trying to intimidate him. Jason Hartman: Unbelievable. So the other case. Karine Bouis-Towe: The other raid that buying club had also a 2 year long investigation included the FDA because there were raw milk products from across state lines, even though in the state of California you can sell raw milk, they had been getting milk in from the Amish again because they really appreciate the detail and type of milk that they can get from the Amish. And that’s why the FDA was involved and then several other local jurisdictions were involved at the LA county police and sheriff and so forth. And, in that case, they arrested 3 people, the owner of the store, a farmer, and a farmer helper. They dumped all their product. That was in Venice, California. They dumped all the milk, they took all the money, they took all the computers. They shut the whole place down. And all those people and the producers and the farmers are now out of work. Jason Hartman: And hopefully they’re out of jail. Did they have to post bail? Karine Bouis-Towe: They’re out on bail, but they are fighting for the heavy expenses, legal cases right now, all 3 of them. Nobody’s gotten off. Jason Hartman: I mean, Karine, this is like too unbelievable for fiction really what you’re telling me, because at a time of major economic peril in this country, the government is using its resources for 2 year investigations against people where nobody has become ill, there has been no actual problem. Are you really telling me that? Karine Bouis-Towe: I am. Absolutely, they have it out for the movement that’s going on which is people seeking food directly from food producers and farmers. They’re out to get them and they’re wasting our money on it. Jason Hartman: I mean it would seem sensible, you could rationalize it if someone had purchased this raw milk, consumed it and become sick and made a complaint. Karine Bouis-Towe: You know on the same day that this Venice raid occurred that 36 million pounds of Turkey was recalled by Cargill? And do you think anybody’s accountable for that? And there was one person dead and 80 sick – unbelievable. Jason Hartman: And let me guess – they didn’t go into Cargill’s factory where they’re producing that turkey with guns pointed and shut them down, right? Karine Bouis-Towe: They have no accountability whatsoever. They just move on. Jason Hartman: Unbelievable, that’s just unbelievable. If you can do this, Karine, I want to ask you to try to stand in the government’s shoes for the moment, and what is their side of the story? I mean you’ve alluded to that already I think. But what makes them feel justified in doing this? And who’s calling the shots? Who really makes that decision? We’re gonna go in and raid these people. Where in the government does that decision make? Karine Bouis-Towe: That’s made very high up, especially when you’re talking about the Amish who are being affected by these government regulations and enforcements. But unfortunately I believe the people who are actually going in on the farms and carrying these things out are just doing what they’re told. And they believe what they’ve been told by the FDA which is milk’s dangerous, raw milk is dangerous. They don’t differentiate the kind of raw milk. And the people think that they’re saving people’s lives which is not the truth. They are just carrying out corporate interest, what they want which is to get this market out, reduce us. Jason Hartman: They’re basically pursuing corporate capitalist rights, well really anti-capitalist rights actually because they’re trying to eliminate competition and they’re doing it with a barrel of a gun pointed at someone. Jason Hartman: That’s just unbelievable. What else can you tell us about this? I mean what else should people know about your organization and consumer options, things like that? Karine Bouis-Towe: Well, I would encourage people who want to know what’s in their food to start purchasing from your local farmers and be concerned about the centralized food system and know what you’re consuming, because our feeling is that with what they’re doing with the lack of laws and oversight that our government’s willing to do for us as consumers is hurting people’s health and affecting them. The reason I got into raw milk and changed my diet is cuz my mother died in her 50s and my grandmother’s still alive and she’s 95. So I felt like sleeping has gone terribly wrong in the last 100 years. And I personally don’t want to leave my children and my grandchildren prematurely. So I really would encourage people just to think about what they’re putting in their bodies. Jason Hartman: Yeah, no question about that. It is amazing to me, and I only recently noticed this, but in Los Angeles where I just moved from Orange County, California to Scottsdale, Arizona, and in just listening to the radio in those two different markets, I cannot believe how many commercials there are in the Los Angeles radio market for cancer treatment centers. It blows my mind. And this is like an industry – I call it the sickness industry. It must be so incredible profitable to imagine that on every commercial break practically on a talk radio station, I’m talking about KFI and this one but I’m sure KBC and all the other big stations there same thing, you hear a commercial for one of a whole bunch of different cancer treatment centers. I mean this is a total business, isn’t it? Karine Bouis-Towe: It’s an industry and it’s really scary because it’s like a cycle. Have them buy all this food that makes them sick and then treat with all the cancer cures, or not cures but treatments, that are astronomically expensive. I mean I haven’t done the research to say that the food processing companies are also invested in the pharmaceutical companies, I don’t know the answer to that. Jason Hartman: Well, certainly the obesity epidemic is a food problem. And it’s really interesting in watching that documentary King Corn – have you seen that one? Karine Bouis-Towe: I have not seen King Corn. Jason Hartman: You’ll like King Corn. Check that one out. I’m sure you’re familiar with Food, Inc. That’s a big one. Karine Bouis-Towe: And Farmageddon’s a new one that just came out that highlights a lot of the raids that are occurring around this country. Jason Hartman: Fantastic. That ones on my list now. I haven’t heard of that one but I will check it out for sure. But it is really incredible. Talk to us for a moment before you go about how this is stifling the rural economies. I mean it’s all about big corporate farming and making sure that does well while putting the little farmers out of business. I mean any examples or info you want to share on that? Karine Bouis-Towe: Well, that’s to me the reason why right now raw milk is at the center. It’s the catalyst of this movement because when you have a cow on the farm, they produce butter, milk, cheese, byproducts that create sustainability on the farm. They can produce chickens and pigs, eat and drink skim milk and the byproducts of all the things a cow produces, and the cow produces fertilizer for vegetables. So here you have one animal that sustains an entire farm and her products are not legal to sell. So basically what that does is put the small and the independent farmers, not just small, out of business, out of the game. So it’s important to start with raw milk and see how we can help grow those local economies, make them sustainable. Put people back on the farm who want to be there cuz it’s unaffordable to farm. You have to have one person working off the farm to even maintain yourself. And it’s hard work. We don’t want our farmers in courts and in jail trying to defend themselves for just trying to make a living the way our forefathers did. Jason Hartman: Yeah, that’s interesting. I didn’t realize how central the cow is to a farm, but you’re right and that’s absolutely interesting. What about pasteurization? For example, say the small farmer wanted to pasteurize their milk and not have raw milk and sell it. Could they do that? I mean are they prohibited? Is it too high of a buried entry in terms of cost? Are they not allowed to sell pasteurized milk or can they just not pasteurize it? Karine Bouis-Towe: Definitely. In 39 states, there’s different ways you can purchase raw milk. And in some of those states people also produce and pasteurize on their farm. I mean the difference is you can’t compete with the prices of the industrialized food system that’s producing really cheap milk, really low quality cheap milk. So it behooves the farmer to even pasteurize and try to sell it because the product isn’t as nutrient dense then and they can’t get the same price they can for raw milk. Raw milk sells for an enormous value. Like the west coast like $20 a gallon, the east coast it’s $6 a gallon. So pasteurized milk just isn’t gonna pull the farmer up enough to make it worth it. Jason Hartman: Yeah. I see what you’re talking about. Well, Karine, this has been a great education. What can listeners do to help with the effort that you’ve talked about today? Karine Bouis-Towe: Well, please visit us at FarmFoodFreedom.org. And we also have a Facebook page from Food Freedom Coalition and like us there because we really want to show the nation and our government that there are many consumers out there concerned about this, irritated about the waste of money. We really would like to see people across the nation get involved. We on our website have a partner’s section and also what you can do. And we’re going to be doing some active on-the-ground rallying in the next couple of months. So get on our Facebook page and you can join us. Jason Hartman: Fantastic. Well, thanks so much for joining us today and thanks so much for telling about this all important issue and good luck with your case out there. I’m sure Jonathan will do a fantastic job representing you. And I just hope that you raise enough money to afford him and to make that happen and maybe make it his 9th win against the FDA. Karine Bouis-Towe: Absolutely. Thank you, Jason, for having me. Announcer: What’s great about the shows you’ll find on JasonHartman.com is that if you want to learn how to finance your next big real estate deal, there’s a show for that. If you want to learn more about food storage and the best way to keep those onions from smelling up everything else, there’s a show for that. If you honestly want to know more about business ethics, there’s a show for that. And if you just want to get away from it all and need to know something about world travel, there’s even a show for that. Yep, there’s a show for just about anything, only from JasonHartman.com or type in “Jason Hartman” in the iTunes store. Are Mega-Corporations Directing the New World Order?